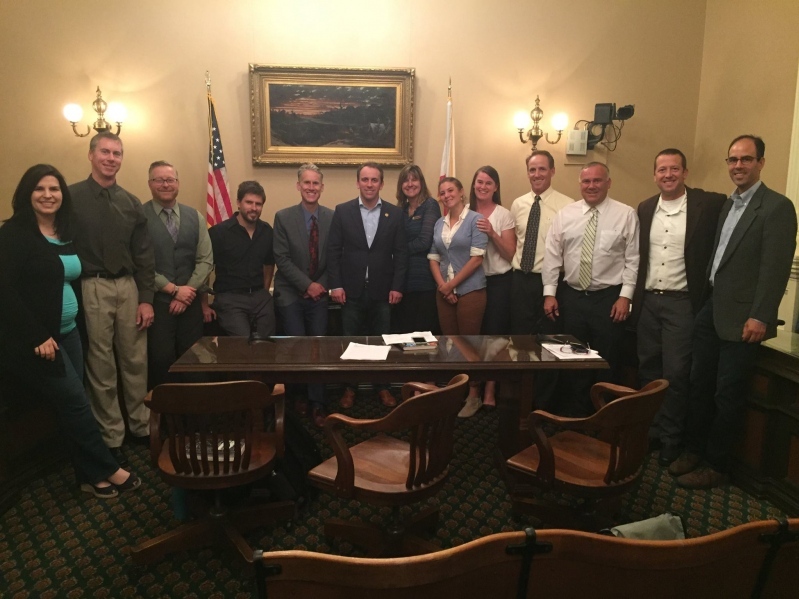 It took some fast and furious planning to pull together the first annual Mountain Bike Lobby Day in Sacramento on May 23, 2017. Efforts from key trail advocates from around the state, led by California International Mountain Bicycling Association (IMBA) Region Director Laurel Harkness, pulled together an an impressive list of high level meetings and office appointments in a very short time. Our schedule included meetings with the staff of seven assembly members and five senators with a bonus sit down with Assembly Member Mark Levine (10th District). In addition our all star advocacy team had a meeting with Jerry Perez, the California Director of the Bureau of Land Management, and Alexandra Stehl, the California State Park Roads and Trails Program Manager. The group of advocates that had gathered from around the state represented several IMBA chapters and other cycling and trails organizations as well as the National Interscholastic Cycling Association (NICA). The goals of this Lobby Day were to convey the message of the popularity and growth of mountain biking in the state as well as the capacity of IMBA chapters and other similarly aligned groups to partner with agencies to plan, build and maintain trails and cultivate stewardship of our outdoor spaces. These partnerships were emphasized as a sustainable solution to do work that understaffed agencies just can't do on their own. We also wanted to convey the economic benefits of mountain biking and outdoor recreation in general to the state as well the benefits to the population of having increased access to trails and the outdoors. Another goal was urge the representatives to support a few Bills as well as Assembly Joint Resolution 15. (check table below for details on these as well as links to the details if you would like to learn more). We all attended a Water, Parks and Wildlife Committee Hearing first thing in the morning to hear testimony and witness the vote on Assembly Joint Resolution 15. This Joint Resolution would urge the President of the United States, the Secretary of the Interior and the Secretary of the Agriculture Department (who is in charge of the US Forest Service) to protect federal public lands and to honor and protect the of our National Monuments. While not all National Monuments are suitable for mountain biking there are some that already allow well planned and managed trails systems such as Fort Ord and the San Gabriel Mountains and other newly designated monuments that have amazing opportunities for new trails. A valued member of our team, Austin McInerny (President of the National Interscholastic Cycling Association), gave passionate testimony regarding the recreational and stewardship opportunities offered in these precious open spaces and public lands. The resolution passed in committee and will go to the floor very soon for a full vote. The day continued with our team dividing and conquering to attend all of the scheduled meetings. We had some challenges navigating the capitol building dodging loads of kids doing scavenger hunts and very helpful staffers but managed to make all of our appointed rounds. We gained confidence as we went and the momentum built throughout the day for all of us. I personally helped lead meetings with the offices of Assembly Members Lorena Gonzalez (AD 80) and Eduardo Garcia (AD 56), and Senator Joel Anderson (District 38). An outcome of this trip is that we all learned tips and strategies that we can carry forward for future lobby days but also that we can use at home with local elected officials and land managers. Skills learned here will also help us in creating more effective calls to action and advocacy efforts. Our meeting with California State Park Road and Trail Program Manager Alexandra Stehl was constructive. Our group is very concerned with the lack of progress in certain parks even when it comes to basic trail maintenance. Specifically, we implored the State Parks to immediately issue a clarification that routine maintenance on existing State Parks trails does not require formal California Environmental Policy Act (CEQA) review. We find no basis for State Parks current practice of requiring a lengthy resource specialist review of even the simplest maintenance projects. After having presented this request during the meeting, our group is now delivering a letter signed by the group to Lisa Mangat, Director of California State Parks. All in all it was a very productive day. Glad that I had packed a pair of flat sandals in my bag as I would not have lasted in even short heels for the entire day. The connections made with the offices of our elected officials are vital to moving our agenda forward and the time spent with our trail advocacy cohorts is invaluable. I learned a lot and value the opportunity to be able to travel and speak for all of our San Diego County mountain bikers and other trail users. Lastly, do not underestimate the value of picking up the phone or writing an email to your elected officials about issues which you are passionate about. If you are concerned about progress on trails projects or how your public lands are being managed please consider communicated with your state Assembly Member or state Senator. SB 5 California Drought, Water, Parks, Climate, Coastal Protection, and Outdoor Access For All Act of 2018.